Half the fun of owning a home at the beach is decorating it with your own personal coastal style. If you're looking for artwork with loads of personality for your seaside home, you'll definitely want to plan a visit to Wrightsville Beach Art Company. 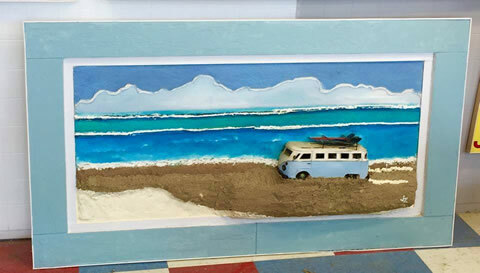 Wrightsville Beach Art Company is the inspiration of Jazz Undy, who creates unique, 3-D nautical landscapes with oil paints and discarded and "found" materials. A piece of Jazzy Boy Art becomes an instant focal point in any room. Jazz was born and raised on the Maryland shore, and his attraction to water strongly influences his work as an artist. Jazz and his partner Maureen Mountcastle created a slogan that perfectly describes their two-pronged mission. "Ocean Detox" not only refers to the cleansing of the body and soul that occurs so naturally at the beach, but the moniker is also meant to increase awareness of the overabundance of debris and recyclables that end up in the world's oceans and waterways. 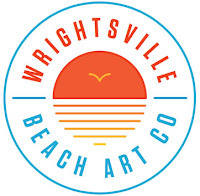 Wrightsville Beach Art Company opened recently at 32. N. Lumina Ave. in the former Rita's Italian Ice storefront. The gallery has a friendly, approachable atmosphere; kids love petting the resident pooches and trying out the unique Art-o-Matic vending machine, while grown-ups browse through one-of-a-kind works of art and jewelry creations made from upcycled materials. 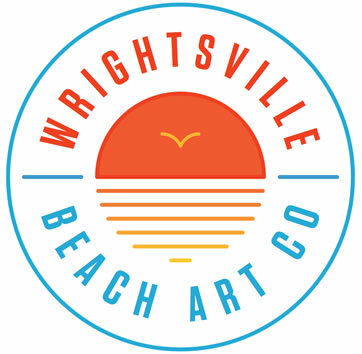 Wrightsville Beach Art Company is open most days 11am - 7pm. To see more examples of their work or to get more insight into their mission, visit their Facebook page and website.